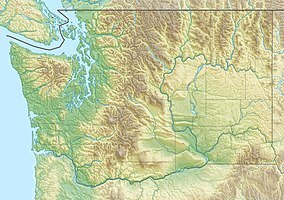 Jarrell Cove State Park is a Washington state park on Harstine Island in south Puget Sound. It consists of 67 acres (27 ha) of forest with 3,500 feet (1,100 m) of saltwater shoreline. Park activities include camping, hiking, biking, boating, scuba diving, fishing, swimming, waterskiing, clamming, crabbing, field sports, beachcombing, windsurfing, birdwatching, wildlife viewing, and horseshoes. Jarrell Cove State Park administers five satellite state parks: Eagle Island, Harstine Island (a day-use park 2 miles (3.2 km) from Jarrell Cove with beach access via a 0.5-mile (0.80 km) trail), Hope Island, McMicken Island, and Stretch Point. The park was established in 1953 and gradually expanded in the 1960s. It was initially known as Gerald Cove State Park, but the spelling was corrected in 1966 upon the request of the Hartstene Island Grange. ^ a b "Jarrell Cove State Park". Geographic Names Information System. United States Geological Survey. ^ a b c "Jarrell Cove State Park". Washington State Parks and Recreation Commission. Retrieved August 10, 2018. ^ "For Free, Once: State Pays $1,860 For Strip of Beach". The Seattle Times. August 21, 1961. p. 20. ^ "Park Name Is Changed". The Seattle Times. Associated Press. February 2, 1966. p. 9. This page was last edited on 22 November 2018, at 11:19 (UTC).